spell Bachs musical signature...The work will be played in its entirety. for which they were originally scored, by the early 20th century composers who defined Impressionism in music. group will also premiere a new work by quartet member Eric Hewitt. 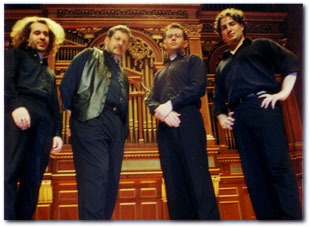 The work of Edison Denisov (Quintet) will be performed with John McDonald, for several years Radnofsky recital partner. All programs include a 4 day residency stay (per program) by the Radnofsky Quartet, and will include workshops, masterclasses, open rehearsals and discussions led by each member of the quartet (program #s 1-4), and a fifth by composer McDonald (option 5).Sponsor may schedule up to 5 hours per day of Radnofsky Quartet events per residency, with one public performance per residency. A standing ovation by a generous and appreciative audience Jordan Hall (New England Conservatory, Boston) following a magical 2003 debut; this new quartet represented the development of thirty years of performance and teaching (all members were/are his former students) for founder Kenneth Radnofsky. -Said Radnofsky, ‘This is the finest quartet with which I've ever performed. I don't believe we could have put together a better quartet, anywhere. It's the closest to a matched set that I could have imagined, while still leaving plenty of room for individual personalities.' The Radnofsky Quartet has commissioned or premiered works by Lei Liang, Armand Qualliotine, John McDonald, Eric Sawyer, John Morrison, Felipe Lara, Lansing McCloskey, Margaret McAllister, Howard Frazin and Fran Trester. Their recordings of Elliott Schwartz 'Hall of Mirrors,' for saxophone quartet and piano, with the composer at the piano, and Armand Qualliotine's Fantasia on B.A.C.H., have recently been released on Albany Records. Philipp A. Stäudlin, a native of Friedrichshafen, Germany has performed hundreds of concerts throughout the United States, Germany, Switzerland, Russia, Austria, Sweden, France, Italy, Japan, Mongolia, and South Korea, as well as performing at major music festivals in Schlesswig-Holstein, Tanglewood, and at Gidon Kremer’s Lockenhaus Festival. As the youngest competitor, Stäudlin won First Prize in the Gustav Bumcke International Saxophone Competition. As a member of the New Art Saxophone Quartet he received First Prize in the Chamber Music Competition of the German Music Foundation and the Artist in Residence newcomer’s award with German Radio. Graduated from Basel Musikhochschule in 1999, Stäudlin received a Soloist Diploma with Honors, having studied with Marcus Weiss and Iwan Roth. Philipp A. Stäudlin was funded by a full scholarship from the German Academic Exchange Service (DAAD) to study with Kenneth Radnofsky at Longy School of Music, where he received the Artist Diploma and the Victor Rosenbaum Medal as the most outstanding student in 2002. Mr. Stäudlin teaches on the applied faculty at Tufts University. He is the soprano saxophonist of the Radnofsky Quartet, and a member of the White Rabbit new music group. Current solo CD releases include Debussy’s Rhapsody with NY Philharmonic (Teldec 13133), Radnofsky.com(Boston Records 1043), Fascinatin’ Rhythms (Boston Records 1044), Martino’s Concerto (New World 80529-2), Colgrass’ Dream Dancer (Mode 125) and Schwartz’s Mehitabel's Serenade (Albany-Troy 646), and Franz Waxman’s A Place in the Sun: Hollywood Bowl with John Mauceri (Philips 4321092). Radnofsky's teachers were Joseph Allard, Jeffrey Lerner, David Salge, Steven Hoyle, Terry Anderson and Duncan Hale. 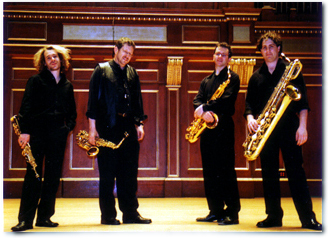 He is Saxophone Professor at The Boston Conservatory, New England Conservatory, Longy School, and Boston University. Praised by Fanfare Magazine as being a “hugely sensitive musician”, saxophonist Eliot Gattegno enjoys an international career as a soloist and chamber musician. He is the winner of the Tourjee Alumni Award of New England Conservatory and the only saxophonist – and one of the few Americans – to ever have won the “Kranichsteiner Musikpreis” of the Internationalen Ferienkursen für Neue Musik Darmstadt. He has appeared as a soloist, recorded and collaborated with leading orchestras and ensembles around the globe including Klangforum Wein and Boston Modern Orchestra Project, and worked with conductors including James Levine, Michael Tilson Thomas, and Kurt Masur at festivals such as Tanglewood, Yellow Barn, Shanghai, Prague, and Spoleto USA. A former Artist-in-Residence at Harvard University and faculty of the New England Conservatory Preparatory School, he has presented guest lectures at Columbia, Princeton, Stanford, and the University of California, Berkeley. He holds degrees from Interlochen Arts Academy and the New England Conservatory, where he studied with Kenneth Radnofsky. Eliot can be heard on Albany, Cantaloupe, Innova, Mode, and Spektral Records amongst others. At age 32, saxophonist, conductor, composer/arranger, and educator Eric Hewitt enjoys an active and diverse musical career with activity throughout the world. Based in Boston, Massachusetts, he serves primarily as Chair of the Boston Conservatory Woodwind Department, and is the music director and conductor of The Boston Conservatory Wind Ensemble. He also serves as music director and conductor of White Rabbit, an avant-garde ensemble-in-residence at the Harvard Group for New Music, and of the Charles River Wind Ensemble. In addition to his active American schedule, he has appeared as saxophonist or conductor in Ireland, the UK, Italy, Germany, France, Japan, Venezuela, Canada, and Cuba. 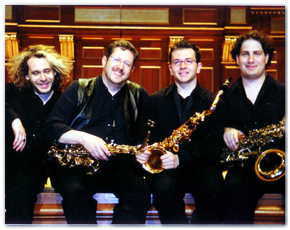 As a saxophonist, he is a founding member of the Yesaroun’ Duo (with percussionist Samuel Z Solomon) and the Radnofsky Saxophone Quartet, and has performed as soloist or guest artist with the Boston Pops, The New World Symphony, The Ryles Jazz Orchestra, The FROMM Players at Harvard, and The Tanglewood Music Center. He can be heard with the Boston Modern Orchestra Project on several BMOP Sound recordings, as well as on the Albany, Troy, Vee Records, and Innova labels. Yesaroun’ Duo’s recent recording project HeavyUp/HeavyDown is available on Gunther Schuller’s GM recordings, and can be found on iTunes.